Glucuronoxylans, a low-value byproduct from pulping, biomass pretreatment and other biomass processing industries, have been considered to be potentially used as emulsifiers. However, the poor amphipathic property of glucuronoxylans limits their application as emulsifiers. 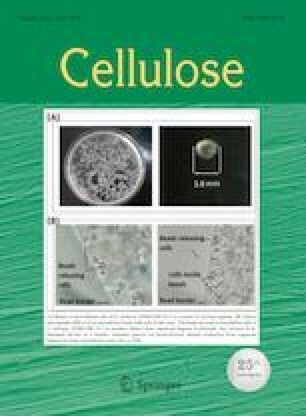 To improve the amphipathic property of glucuronoxylans and develop high quality natural-based/green emulsifiers, glucuronoxylans were chemically modified by alkenyl succinic anhydrides to produce a novel emulsifer. The effects of degree of substitution (DS) and alkenyl chain length on the emulsifying properties of long-chain succinic anhydride modified glucuronoxylans were investigated. Dodecenyl succinic anhydride–glucuronoxylans (DDSA–glucuronoxylans) emulsions showed much smaller droplet size, lower zeta potential, higher emulsifying activity and better emulsion stability compared to that of glucuronoxylans emulsion. When DS increased from 0.014 to 0.09, the emulsifying properties of DDSA–glucuronoxylans were improved. However, when DS increased beyond 0.09, the emulsifying properties were not changed significantly. Furthermore, the alkenyl chain length also has a positive impact on emulsifying properties of long-chain succinic anhydride modified glucuronoxylans. These results suggested that long-chain succinic anhydride modified glucuronoxylans had a potential to be used as emulsifiers, while the DS and chain length should be kept at a proper value. This work was supported by the National Natural Science Foundation of China (31770621 and 31600470), Guangzhou Science and Technology Program (General Scientific Research Project 201707010053), Guangzhou Science and Technology Program (Key Scientific Research Project 201707020011), and Guangdong Province Science Foundation for Cultivating National Engineering Research Center for Efficient Utilization of Plant Fibers (2017B090903003).